It took me quite a while to decide what to pair the kiwifruit sorbet with. I had one of those moments where you're lying in bed, trying to sleep but the cogs in your brain are ticking overtime. Amongst the jumble of other thoughts about everything from the housework to what data analysis should I be using for my Zoology experiment, jumped out a single word: Pavlova. 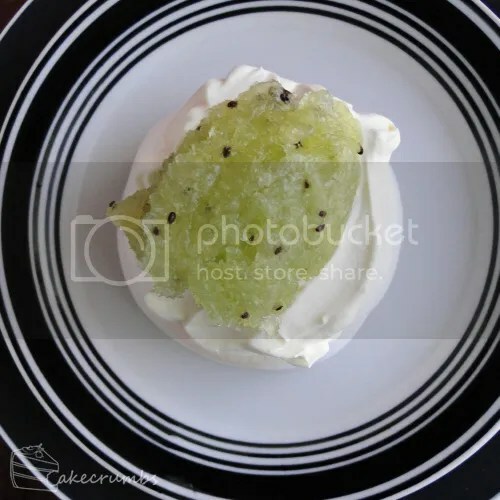 Pavlova? Pavlova! Seriously, I will jump at any excuse to make a pav. Given we're in winter now, there's not the same lovely variety of fruit to top them with, so this sorbet fill the gap nicely. I'm pretty sure we ate far too many of these over the course of the day, but they are both so delicious and so refreshing it's difficult to stop at one. I left the cream unsweetened as there's more than enough in the pavlova itself to balance this. The sorbet itself is slightly tangy, owing to the citrus in it, and so it equally cuts through the sweetness (tricking you into thinking you need more). 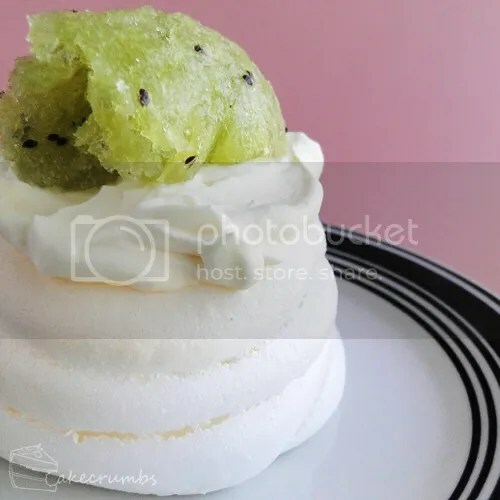 This could work just as well with a meringue nest, but the part I love about a pavlova is the soft, marshmallowy interior. I used a simpler pavlova recipe this time and piped it into 6 rounds. The baking time will differ based on how large you make your rounds. You will know it is cooked when the outside is lovely and crisp and will usually have started to crack slightly. If syrupy droplets begin to form on the meringue, you have overcooked it. Whisk eggwhites until stiff peaks form; gradually beat in the sugar one tablespoon at a time until all combined and mixture is stiff and glossy. 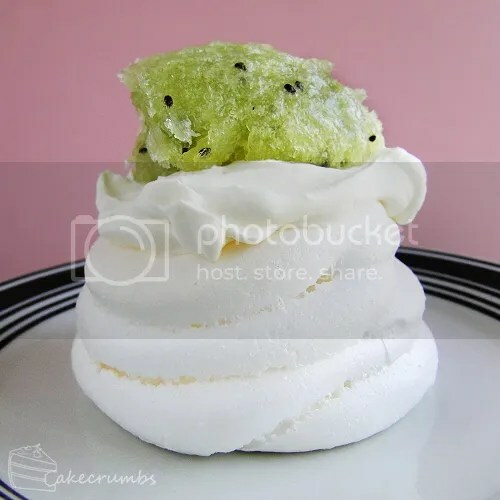 Sprinkle cornflour and vinegar over the surface of the meringue and gently fold in until just combined (you do not want to lose any of the volume you've just beaten into your whites). Pipe the meringue into 6 rounds; alternatively, dollop the mixture and smooth the sides with a butter knife or palette knife. 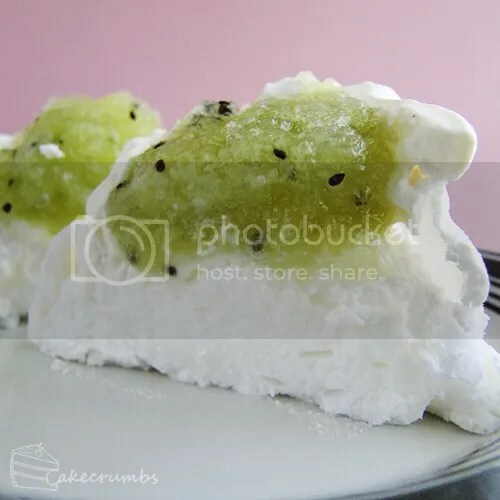 Pop the meringue in the oven and immediately reduce the temperature to 120°C (110°C fan forced/250°F); bake for 25-30 minutes. The higher initial temperature will help give your pavlova a lovely crispy exterior, while the lower temperature as the oven cools will give the interior the marshmallowy texture as it bakes. When pavlovas are done, turn off the oven and leave them inside to cool completely before transferring to a serving dish. Top with cream and desired toppings. NB: Undressed meringue will keep in a air tight container at room temperature for about 5 days.